There’s more to the 2020 Subaru Legacy than just its Tesla-like vertical 11.6-inch touchscreen and a new turbo-4 engine. Squint and it’s easy enough to imagine the Legacy morphed into a wagon body, some chunky side cladding, and a taller ride height. 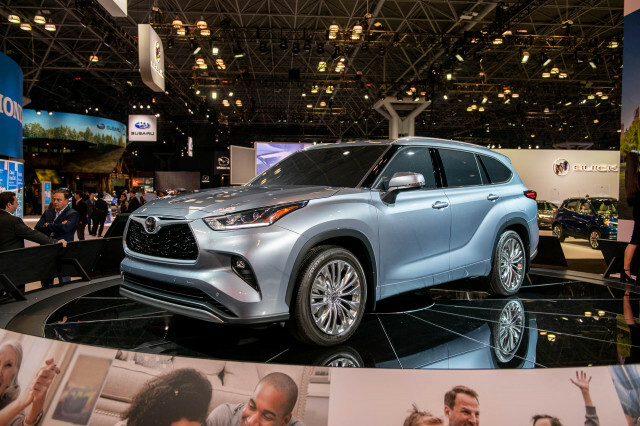 The 2020 Legacy unveiled Thursday at the 2019 Chicago Auto Show is a preview of the automaker’s next-generation Outback crossover SUV. 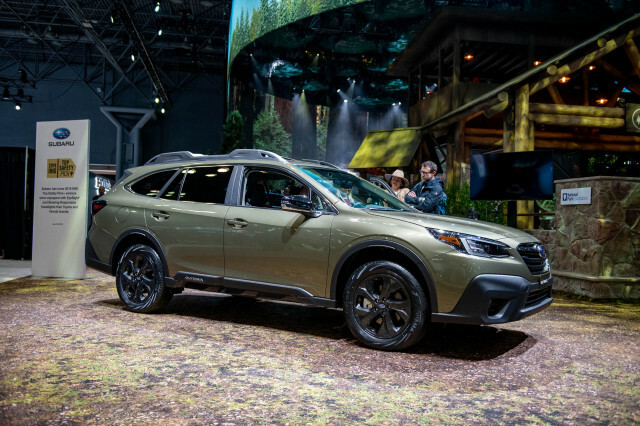 Subaru delivered nearly five Outbacks for every Legacy it sold last year, a clear reminder that shoppers are overwhelmingly in favor of high-riding vehicles. But enough about what we don’t yet know. The 2020 Legacy will go on sale this fall in base, Premium, Sport, Limited, Limited XT, and Touring XT trim levels with a number of familiar Subaru virtues intact: standard all-wheel drive, flat-4 engines, and a host of standard safety tech. All but the base Legacy feature the largest infotainment screen on a mainstream mid-size sedan. The 11.6-inch touchscreen features Apple CarPlay and Android Auto compatibility plus available built-in navigation. Some versions include Harman Kardon speakers, too. 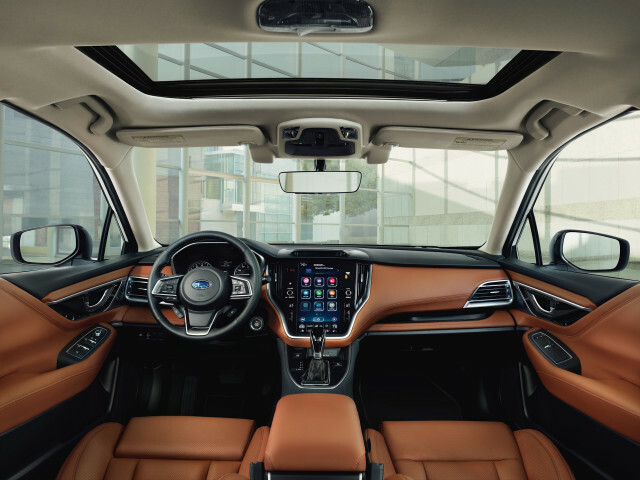 Unlike the 2020 Ford Explorer’s vertical screen that sits proud of its dashboard like a tablet, the Legacy’s display is flush with the dashboard. It’s flanked by climate control vents and a smattering of conventional buttons and knobs for volume, tuning, and some climate controls. The base Legacy is the only trim level without the big screen, although it's hardly lacking for tech. 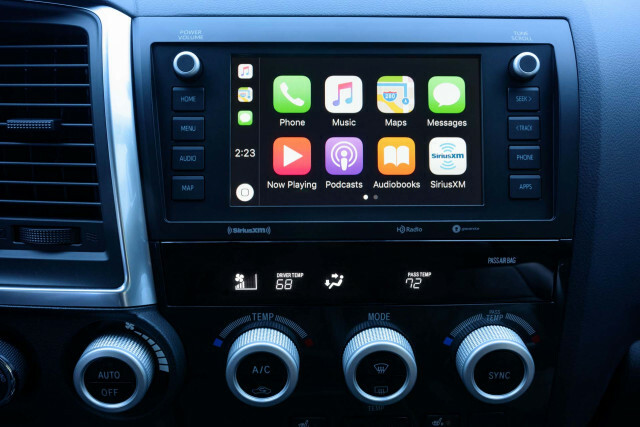 Instead, it uses a pair of a 7.0-inch displays—one for audio and one for climate controls— and it too features standard Apple and Android compatibility. High-spec Legacys are available with heated and cooled front seats wrapped in nappa leather trim, 12-way power front seats including an adjustable cushion for the driver, and a heated steering wheel. 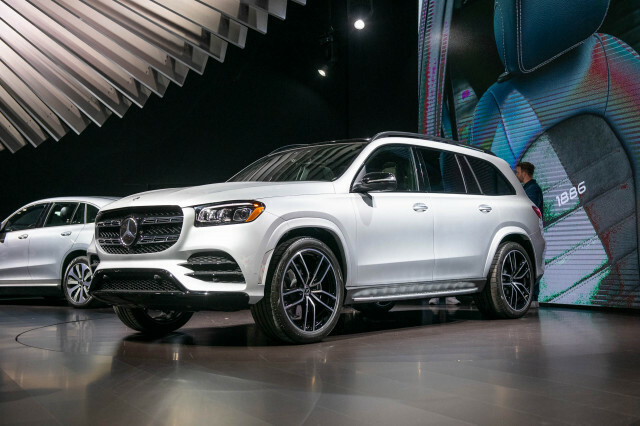 The new Legacy features up to four USB ports and can be had with a wireless charging pad and a wi-fi antenna that turns the vehicle into a mobile hotspot. The new Legacy’s 15.1 cubic-foot trunk is slightly larger than the outgoing model’s. Underhood, the new Legacy features a familiar 2.5-liter flat-4 rated at 182 horsepower and 176 pound-feet of torque. 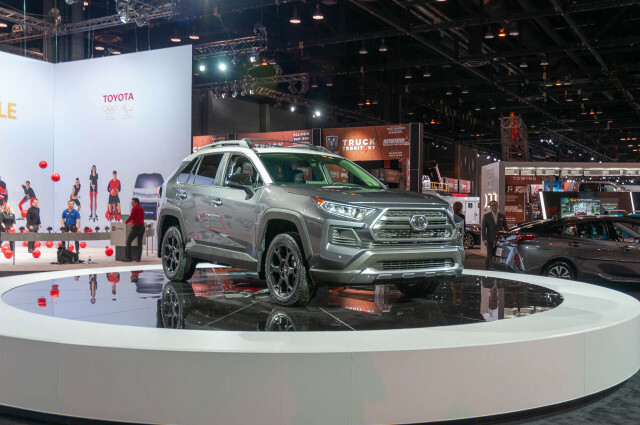 Opt for the new Legacy XT and buyers will find the Ascent crossover SUV’s 260-hp, 277 lb-ft turbo-4. Regardless of engine in front and badge on back, the 2020 Legacy comes with a continuously variable automatic transmission (CVT) that shuttles power to all four wheels. Active torque vectoring, which brakes the inside front wheel during hard cornering to enhance grip, is standard on all. With the turbo engine, Subaru said that the Legacy XT sprints to 60 mph from a stop in 6.1 seconds, while the base engine jogs at a more leisurely 8.4 seconds. The Legacy Sport features gloss-black exterior trim, 18-inch alloy wheels, and red interior stitching plus a sport mode that modifies accelerator response, but it isn’t available with the turbocharged engine. 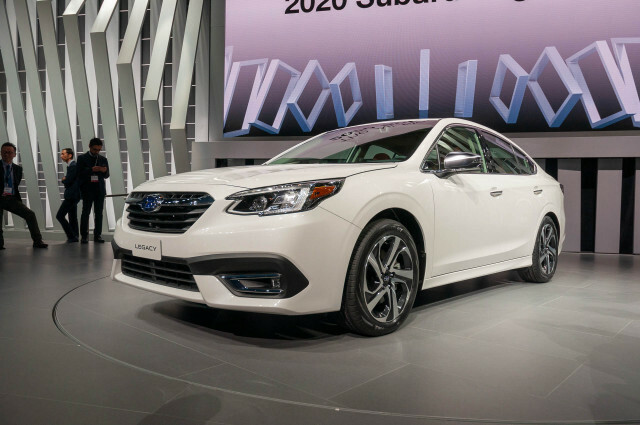 Subaru said that the new Legacy features a much stiffer platform, which should help it maintain the sedan’s already impressive crash ratings. 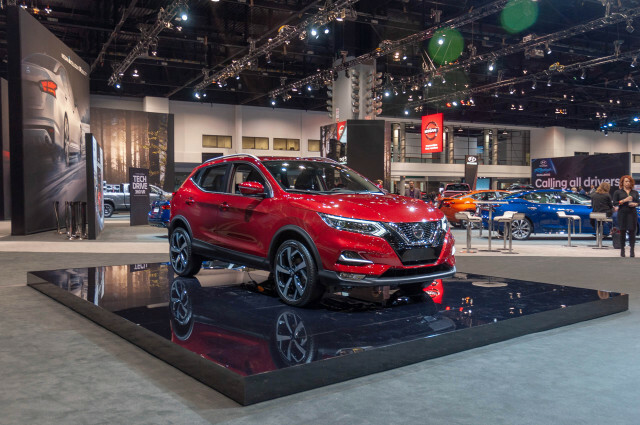 Standard active safety tech such as automatic emergency braking, adaptive cruise control, and active lane control is on board to help prevent a crash. 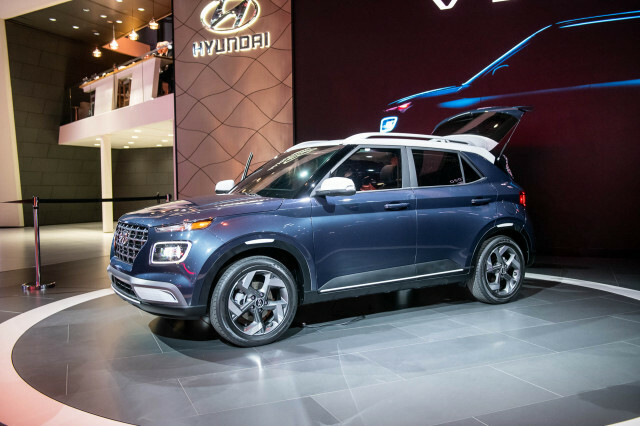 Optional on Legacy Limited, and standard on all XT trims, is an infrared system that chides with an alarm and a visual alert if it detects wandering eyes or a fatigued driver behind the wheel. Subaru did not say how much the new Legacy will cost when it arrives in dealers this fall.